For stained or darkened teeth, often a professional clean followed by teeth whitening is the treatment of choice to brighten and enhance your natural smile. Prior to whitening your teeth, we will assess you for suitability and to see what system is best for your smile. 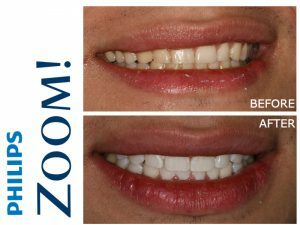 Using the #1 Professional Teeth Whitening system, Phillips ZOOM!, we offer a fast and safe way to whiter teeth. 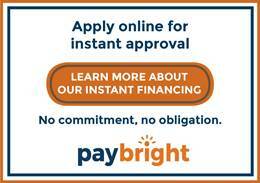 View the videos below for more details on each system. In-office: Shine bright with the in-office system which delivers brilliant results in under an hour. We apply whitening gel to your teeth that is light-activated for 15 minutes. 3 sessions later your teeth will be up to 8 shades whiter. We will also give you a top-up mini at home kit to make sure that your new white smile lasts. Want to find out if you are suitable? Book a FREE consultation with us today or ask us at your next appointment. We love to see our patients and staff smiling, and nothing says confidence than a clean white smile! 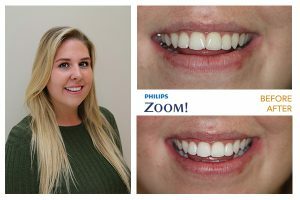 Our office manager Leanne recently decided to try out Phillips ZOOM! in-office whitening for herself.